“‘Who is this that hides counsel without knowledge?’ Therefore I have uttered what I did not understand, things too wonderful for me, which I did not know” (Job 42:3). In the 1960s, Elisabeth Elliot wrote a fictional novel entitled No Graven Image. The story is about an American missionary in South America named Margaret who devotes her life to translating the Bible into the language of an indigenous tribe. To make a long story short, Margaret fails to finish her translation. Margaret had been worshiping a God of her own creation—a God who was supposed to act like her personal assistant. Many Christians have this same concept of God. To them, God exists to do what they think is best. What the book of Job tells us is that the all-wise, all-powerful, all-good God is not our personal assistant. God did finally answer Job: “Then the LORD answered Job out of the whirlwind” (38:1). 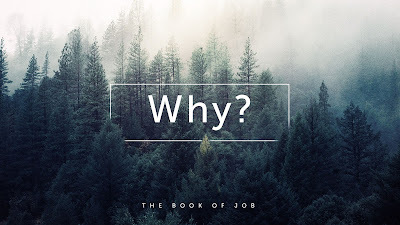 But God didn’t give Job an explanation. (He never told him about dialogue between him and Satan.) The reason for Job's suffering remained a mystery to him. The same is often true of us when we experience suffering. How can we endure suffering without an explanation? God asks Job, “Can you bind the chains of the Pleiades or loose the cords of Orion?” (38:31). The answer, of course, is no. God is not only sovereign over the earth; he is sovereign over all the universe. The psalmist declares, “He determines the number of the stars; he gives to all of them their names” (Ps. 147:4; cf. Isa. 40:26). Do you know how many stars are in our galaxy? Some astronomers say 100 billion; others say 400 billion. And do you know how many galaxies are in the universe? At least 100 billion. God’s is greater than we can imagine! Some people say, “If God is so great, why doesn’t he prevent suffering?” But if God is so great, maybe we shouldn’t question God. We aren’t as smart as we think we are. We’re like little children who say silly things (e.g., “Dad, if you really loved me you’d let me play on the street!”). God said to Job, “Who is this that darkens counsel by words without knowledge?” (38:2). In other words, Job wasn’t as smart as he thought he was. God spoke to Job twice (38:1-40:2; 40:6-41:34). After God finished speaking the first time, Job said, “Behold, I am of small account; what shall I answer you? I lay my hand on my mouth” (40:4). And when God finished speaking the second time, Job said, “I have uttered what I did not understand, things too wonderful for me, which I did not know” (42:3). Job was saying, “I’m not as smart as I thought I was.” And he repented of his pride: “I had heard of you by the hearing of the ear, but now my eye sees you; therefore I despise myself, and repent in dust and ashes” (42:5-6). God asked Job, “Will you condemn me that you may be in the right?” (40:8). The NIV says, “Would you condemn me to justify yourself?” But isn’t that what happened? Jesus was condemned so that we could be justified. “For our sake [God the Father] made [Jesus] to be sin who knew no sin, so that in him we might become the righteousness of God” (2 Cor. 5:21). God is greater than we can imagine, so we can trust him when we don’t have an explanation for our suffering. Not only is God’s wisdom and power great, but his love for us is great! God is not only a sovereign God (“I know that you can do all things, and that no purpose of yours can be thwarted,” 42:2); he’s also a suffering God. If I suffer and say, “I don’t deserve it!”, I should remind myself that Jesus suffered without deserving it. Even if I don’t get an explanation for my suffering, I can have confidence that God loves me and he knows what he’s doing. Job also wanted vindication, which he got in 42:7-9. There are several biblical answers to the question of suffering, such as (1) God allows people to make evil choices; (2) God can use something bad to do something good; (3) suffering can make us better. “If a man dies, shall he live again? All the days of my service I would wait, till my renewal should come. You would call, and I would answer you; you would long for the work of your hands” (Job 14:14-15). We ask the same question that Sam asked: Is everything sad going to come untrue? Is there ever going to be a day when all of the bad things in this world come to an end? Many survivalists believe in the “Survival Rule of Threes.” According to this rule, you can’t survive more than three minutes without air, three days without water, three weeks without food, and three months without hope. We need hope. We need the expectation that things will get better. Job says, “Man who is born of a woman is few of days and full of trouble” (v. 1). In other words, life is short and difficult. Is there any hope for us? Is everything sad going to come untrue? Job says, “There is hope for a tree, if it be cut down, that it will sprout again, and that its shoots will not cease” (v. 7). But is there hope for Job? “But if a man dies and is laid low; man breathes his last, and where is he?” (v. 10). Job thinks that there’s more hope for a tree than for a man. But then Job begins to think about the possibility of life after death: “If a man dies, shall he live again? All the days of my service I would wait, till my renewal should come” (v. 14). The Hebrew word translated “renewal” means “a new vigorous life in a restored body.”  Job desires vindication. If his vindication doesn’t happen in this life, maybe it could happen in a new life after death. But is this just wishful thinking, an “impossible dream” ? What we often forget is that sometimes impossible dreams do come true. Where did Job get this idea of a future resurrection? He thinks it might be possible because of God’s love for him. He says, “You would call, and I would answer you; you would long for the work of your hands” (v. 15). Is there any hope for us? Yes! There’s hope for us because God loves us. God made the first man and the first woman to love him and be loved by him. But when they rebelled against God, they were afraid and hid from him. God found them and said to them, “By the sweat of your face you shall eat bread, till you return to the ground, for out of it you were taken; for you are dust, and to dust you shall return” (Gen. 3:19). But the story doesn’t end there. God longed for the work of his hands, his creatures made from dust. Jesus—God the Son, the second person of the Trinity—became like us so that he could die for our sins. He suffered so that one day our suffering could come to an end. God is “making all things new” (Rev. 21:5). He is putting together this broken world—including the part of his creation that he loves most: us. All who of us who put out trust in Jesus are given the hope of a future resurrection. We will one day be raised from the dead as Jesus was raised. “Just as we have borne the image of the man of dust [i.e., Adam], we shall also bear the image of the man of heaven [i.e., Jesus]” (1 Cor. 15:50). Imagine that you could see the future and you knew when every bad thing would happen to you. If you had this knowledge, I think it would be hard to get out of bed in the morning. We don’t know when, but we do know that bad things will happen in our futures. But we can get out of bed in the morning because God has given us hope. Things are going to get better. Because of God’s love for us, we have hope because of the death and resurrection of Jesus. Yes, there is hope for us. This life is not all there is. There is something more, something better. Everything sad is coming untrue. J. R. R. Tolkien, The Return of the King, 246 (emphasis added). John E. Hartley, The Book of Job (NICOT), 236. David J. A. Clines, Job 1-20 (WBC), 338. Keep in mind that the doctrine of the resurrection wasn’t fully developed when Job lived. Sally Lloyd-Jones, The Jesus Storybook Bible, 347 (emphasis added). “Remember: who that was innocent ever perished? Or where were the upright cut off?” (Job 4:7). What Should We Do or Say? In this world, there is lots of suffering. Every second, one person dies in this world. Job is a book about suffering. When people suffer, they ask two questions: (1) Why has this happened to me? ; (2) How do I get through this? If one of your friends was going through a time of suffering, and he or she asked you these two questions, how would you answer? When our friends suffer, we want to bring them comfort. This is what Job’s three friends—Eliphaz, Bildad, and Zophar—wanted to do. They “made an appointment together to come to show him sympathy and comfort him” (2:11). But Job’s friends didn’t comfort Job. He eventually said to them, “Miserable comforters are you all” (6:2). We don’t want to be miserable comforters like Job’s friends. What should we say or do to bring comfort to suffering people? Job’s suffering was so great that he wished he had never been born: “Let the day perish on which I was born, and the night that said, ‘A man is conceived’” (3:3). Job needed comfort. At first, Job’s friends didn’t say anything: “They sat with him on the ground seven days and seven nights, and no one spoke a word to him” (2:13). But when they finally did speak, what they said didn’t bring comfort to Job. When Elijah the prophet was depressed, he said to God, “Take away my life” (1 Kings 19:4). How did God respond? Before God spoke to the prophet, he sent the angel of the LORD to cook a meal for Elijah (vv. 5-8). People usually need more than just words. What should we say or do to bring comfort to suffering people? Who That Was Innocent Ever Perished? Eliphaz said to Job, “Who that was innocent ever perished? Or where were the upright cut off?” (4:7). Has an innocent person ever perished? Yes, Jesus. “For our sake [the Father] made [Jesus] to be sin who knew no sin, so that in him we might become the righteousness of God” (2 Cor. 5:21). On the cross, Jesus proved Eliphaz wrong! When people go through a time of suffering, they need to know that they are loved. The cross proves to us that God loves us. But people who suffer also need to know that their friends love them. Usually, when disaster strikes, what the person needs is not a lecture or pat answers. They need a mixture of tears and truth. I was sitting, torn by grief. Someone came and talked to me of God’s dealing, of why it happened, of hope beyond the grave. He talked constantly. He said things I knew were true. I was unmoved, except to wish he’d go way. He finally did. Jesus corrected his disciples when they asked about a blind man, “Who sinned, this man or his parents, that he was born blind?” (John 9:2). Jesus answered, “It was not that this man sinned, or his parents, but that the works of God might be displayed in him” (v. 3). By “tears” I don’t mean that we must always literally cry, but we must show genuine concern for those who are suffering. “Weep with those who weep” (Rom. 12:15). Joseph Bayly, The View from a Hearse, 40-41.